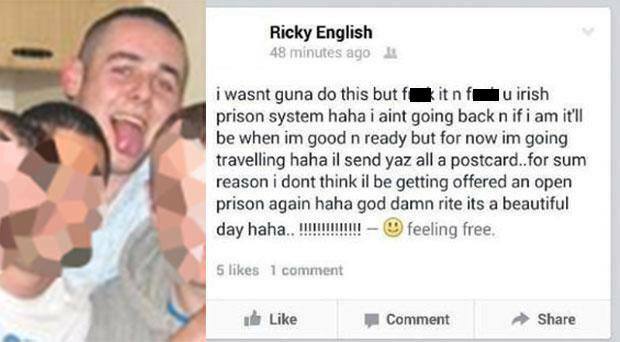 A 24 year-old convicted criminal who escaped from Shelton Abbey in July has openly taunted the prison service on his Facebook page. Ricky English, from Carlow, was serving part of a five year sentence in the open prison for two robberies on bookmakers in Carlow and Wicklow when he walked from the prison. It is understood that members of the Prison Service have been in contact with English in recent weeks to try and persuade him to return to the prison. However, on his Facebook page this week he taunted officials from the Prison Service. “I ain’t going back n if I am it’ll be when im good an ready but for now im going travelling hah ail send yaz all a postcard.” he wrote. He also said on his Facebook page that he was enjoying ‘feeling free’ and he also went on to say that he didn’t think he would be offered a place in an open prison again. It is also understood that members of the Prison Service have been in contact with Gardai to apprehend the criminal.